With 'added sugars' soon appearing on Nutrition Facts labels, consumers will demand natural replacements. Sweeteners are at an interesting crossroads. With the FDA proposing to include a separate “added sugars” listing on nutrition panels, consumers may want to do without the calories those sugars add. But they probably won’t want to do without the sweet taste, so processors may be more motivated to look for low- or no-calorie replacements for sweetness. But they’ll probably have to be “natural” sweeteners. More consumers are recognizing sweeteners such as stevia, monk fruit and coconut sugar, so it’s easier for processors to incorporate them on a clean label, explains Thom King, president of Steviva Ingredients, Portland, Ore.
Steviva Ingredients recently introduced CocoSweet+ coconut sugar as a plug-in replacement for sucrose. Made of coconut sugar harvested from the coconut tree blossoms and water-extracted stevia, CocoSweet+, is free of gluten, GMOs, soy, corn, allergens, pesticides and petrochemicals, King points out. CocoSweet+’s mild caramel flavor pairs well with flavored dairy, teas and chai, King says. And it contains vitamins B1, B2, B3 and B6 and minerals such as potassium, magnesium, zinc and iron. Steviva’s new MonkSweet, MonkSweet+ and MonkSweetLS sweetening systems are made by extracting mogroside V-- the sweetest of the monk fruit glycosides -- from the pulp of the fruit via water extraction. This helps provide a clean flavor. “As the new monk fruit crop comes in, prices should start coming down, making it an affordable and viable solution for food manufacturers,” King notes. Highly soluble MonkSweet can be used as a plug-in ingredient in formulations to replace sucrose or high-fructose corn syrup. 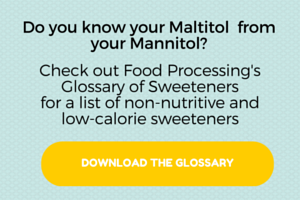 Both CocoSweet+ and MonkSweet also are available at the retail level in 1-lb. bags. Cargill has developed a method of using fermentation to produce certain molecules found in the stevia plant, potentially solving some of the obstacles preventing wider use of the calorie-free sweetener. The Minneapolis-based company separated out 40 glycosides in the stevia leaf to test different combinations for taste and mouthfeel and found a pairing that created the “best” taste, but made up less than 1 percent of the leaf. EverSweet, the resulting product, was invented in conjunction with Swiss biotech company Evolva Holding SA. Unveiled at the SupplySide West show last October, the next-generation stevia sweetener has no bitterness or aftertaste and will be commercially available in the U.S. next year, says Scott Fabro, Cargill’s global product development director of high-intensity sweeteners. That’s where Evolva comes in. The Swiss company helped craft a fermentation process by genetically modifying baker’s yeast to create the two desired compounds. “Fermentation should allow for a dramatic expansion in use of molecules such as rebaudiosides M and D, so producers can create new classes of lower-calorie products that taste great and are affordable,” says Fabro. Cargill so far has been testing EverSweet with potential customers for 18 months. Another next big thing in sweeteners is allulose, predicts Mike Harrison, senior vice president of new product development at Tate & Lyle, Hoffman Estates, Ill. Allulose can be found in small quantities in some fruits and other foods, although Tate & Lyle uses corn as the source for its Dolcia Prima allulose. It has the mouthfeel and 70 percent of the sweetness of sucrose but 90 percent fewer calories, so food & beverage manufacturers can significantly reduce calories in products while maintaining the same taste, the company claims. “Dolcia Prima can be used in combination with non-caloric, high-potency sweeteners like monk fruit and stevia to reduce calories and sugars while maintaining great taste,” says Ami Krishan, category marketing director-sweeteners at Tate & Lyle. Dolcia Prima launched commercially early last year, and customers are now in advanced stages of formulation and approvals for its use in their products. “We’re working with several large baked-goods producers to help them decrease sugar and calories and increase fiber in reduced-calorie brownies, cakes, muffins and snack bars,” adds Luis Fernandez, Tate & Lyle’s senior vice president of global applications. Tate & Lyle is not the only company developing allulose. In July, Matsutani America, Itasca, Ill., announced Astraea allulose, which it says is the first plant-based, low-calorie monosaccharide sweetener with proven physiological benefits. Matsutani says Astraea is scientifically proven both to attenuate blood glucose and lower lipid accumulation. Astraea is created using a process known as “izumoring,” in which a monosaccharide reacts with a microbial enzyme, causing the sugar to change from one type to another. “Until now, rare sugar has been almost unavailable commercially, and has been exceptionally expensive, making it difficult to obtain the steady supply necessary for manufacturing and conducting proper research,” explains Tetsuo Iida, director of rare sugar research and development at Matsutani America. “Astraea is a perfect match for people with diabetes and it’s gluten-free” adds Yuma Tani, with Matsutani Chemical Industry Ltd. in Itami, Japan. There has been a steady stream of new, often natural sweeteners.